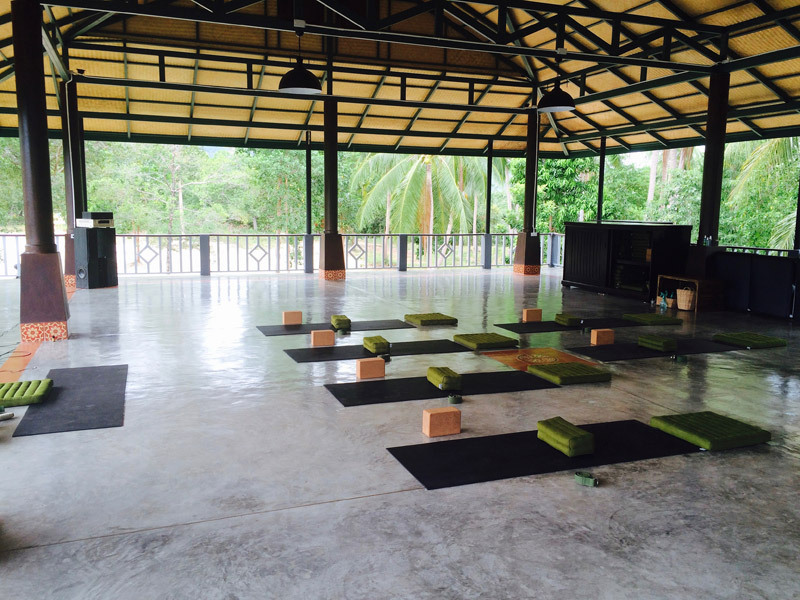 An outstanding premier open-air yoga shala located in peaceful surroundings seven minutes from Thongsala, the main port of Koh Phangan. It is an upper storey oasis with breath-taking panoramic mountainous views. Its unique feng shui design based on the Turtle rests in harmony with the sacred land around it. Open on all four sides, with sunrise and sunset end, and a high ceiling to bring a sense of expansion and merging with nature. The floor has a smooth varnished concrete finish with tile decoration. In the sunset corner there is wooden seating along the side to enjoy the views. Yoga equipment is stored in beautiful large wooden varnished cabinets with give the space a rich and homely feel. The space is one of the largest in Thailand 15m by 20m. Maximum capacity is up to 60 people comfortably for a yoga class. 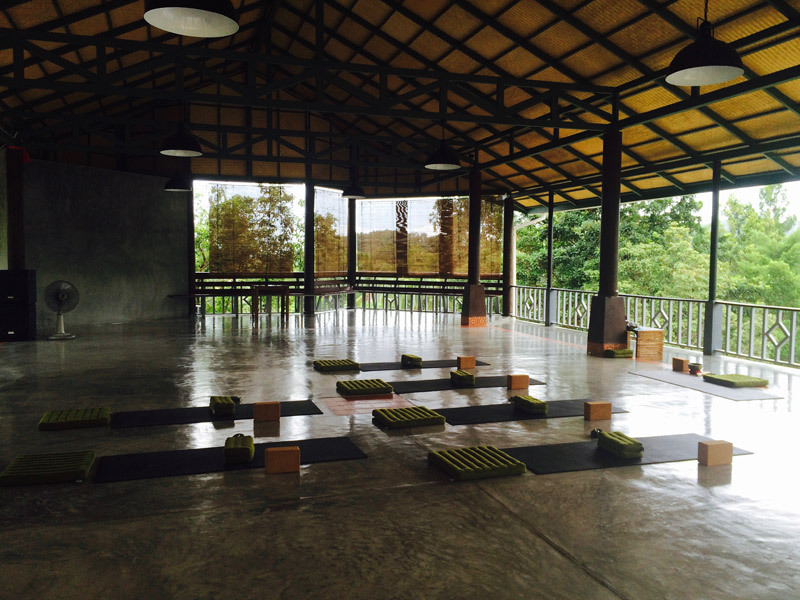 Our shala is fully equipped with high quality yoga mats, bolsters, cushions, cork blocks and straps. There is a quality sound system, floor fans, and we also support a private healing room with at the back of the shala with window and air conditioning. The shala is a secure and private space on an upper level. 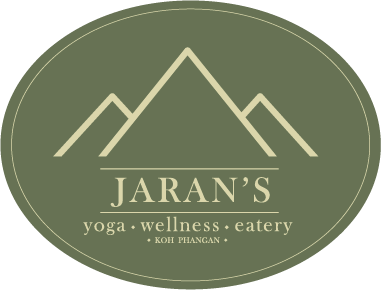 A large car parking space is located at the main entrance to Jaran’s. Our Yoga Shala is available for casual or regular hire for classes, workshops, presentations or meetings, which are aligned with our principles. We want to hold the space for teachers, healers, trainers, therapists and everyone else to spread their message and skills and work together to grow and support each individual business whilst creating a community wave of wellness. We can also offer healthy vegetarian cuisine and drinks, wifi, and the possibility to book holistic therapies for your group with our specialized team. Bring your ideas and your people together and be inspired in our shala. Please check our schedule first as we hold regular weekly classes and events! Alternatively our Live Venue on the ground floor is available for private functions or evening occasions, read more about the venue.